As you may have guessed, I've bitten the bullet and got a new computer. Its much faster at uploading photos and videos so I should be able to get on top of the blog backlog soon. It will take me a little while to get to grips with all the bells and whistles on the new iMac so bear with me! In the meantime, here are some shots of new boy Goofy who arrived on Wednesday with his pal Ernie, who came here a month ago. Goofy has recently had surgery on both front legs to help repair his injured DDFT so he is on a programme of restricted but increasing movement for now. ...and what a bonus to get really grubby without a rug on! Sorry for the hiatus in posts - but the end is in sight, thanks to a potentially expensive afternoon spent in the Apple store in Exeter yesterday and I am hoping to have computer functionality by the end of this week, with a backlog of stuff to post!
" I am trying to find some one to help me figure out the best way to trim my mare. Am losing confidence in the people I have access to ...I'm tired of seeing my poor mare being so sore after trims or farriers doing what they think are best for her which end's up not being best for her. No one seems to want to listen to me." 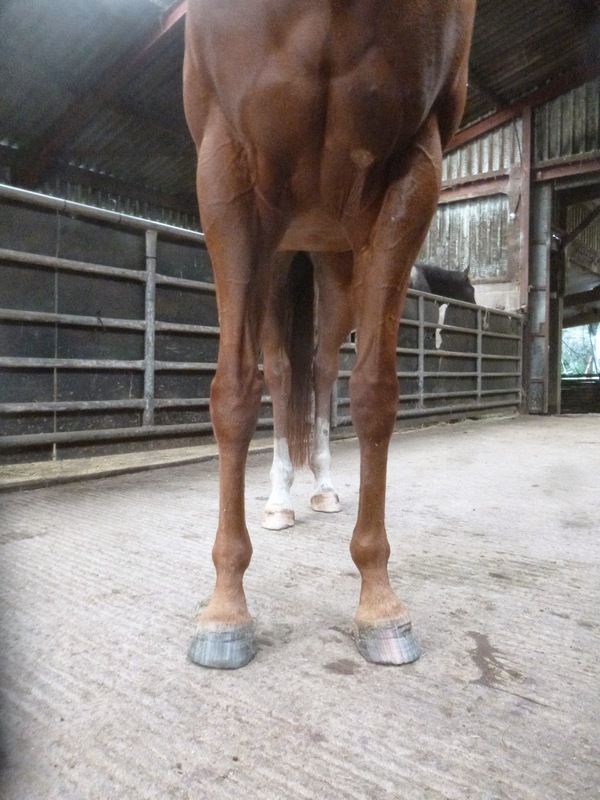 The second is from a vet who has become interested in taking horses barefoot as a rehabilitation tool. 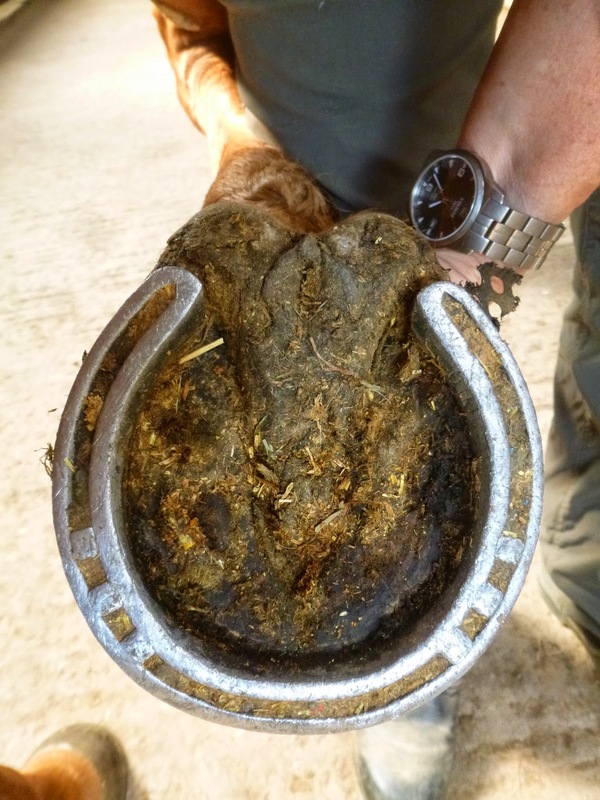 "I have been doing a lot of research on hooves and trimming in the past few years and have taken quite a few horses barefoot actually with very good results. The one horse who brought me back to your work, after being obsessed with DOING something (i.e. trimming) is one of my own horses. This horse had numerous [body] issues and rock hard but very ouchy feet. I was obsessed with trimming then especially as I had the feeling that as soon as I left them alone they got out of shape. 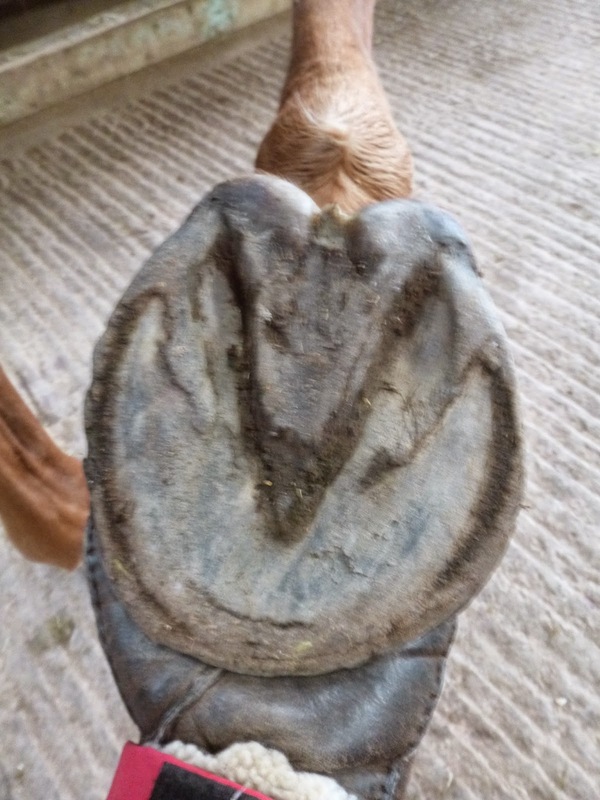 I have started her ( and my other horses) on a no trimming, miles only regime since october 1st, letting her choose her own hoof balance- which is making me incredibly excited and nervous at the same time..... Not only for the feet of course, but also for the rest of the body's health and soundness!" "The daily trimming of fingernails and toenails to make them more aesthetically pleasing could be detrimental and potentially lead to serious nail conditions. The research, carried out by experts in the School of Veterinary Medicine and Science at The University of Nottingham, will also improve our understanding of disease in the hooves of farm animals and horses. Dr Cyril Rauch, a physicist and applied mathematician, together with his PhD Student Mohammed Cherkaoui-Rbati, devised equations to identify the physical laws that govern nail growth, and used them to throw light on the causes of some of the most common nail problems, such as ingrown toe nails, spoon-shaped nails and pincer nails. According to their research, ‘Physics of nail conditions: Why do ingrown nails always happen in the big toes?’ published today, 17 October 2014, in the journal Physical Biology, regular poor trimming can tip the fine balance of nails, causing residual stress to occur across the entire nail. This residual stress can promote a change in shape or curvature of the nail over time which, in turn, can lead to serious nail conditions. 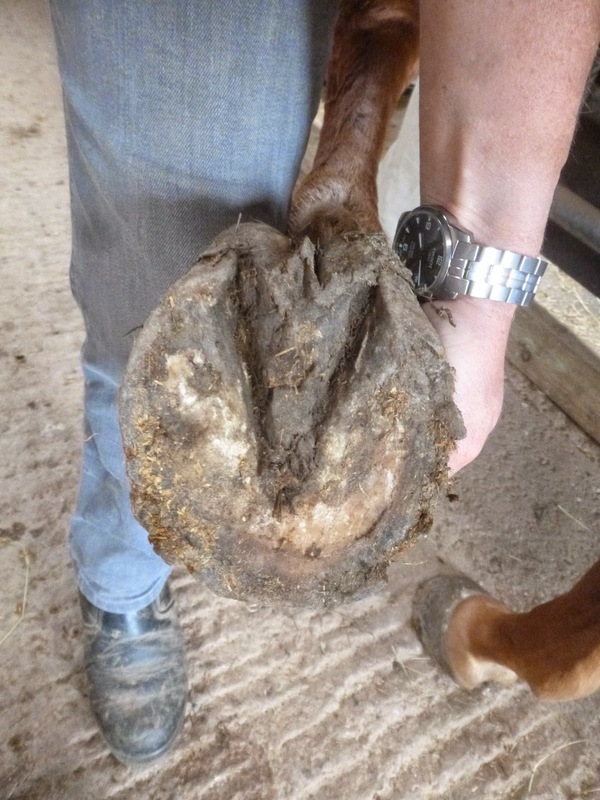 Dr Rauch also said: “Similar equations can be determined for conditions of the hoof and claw and applied to farm animals such as sheep, cattle, or horses and ponies. It started with ingrowing toe nails. In their study the researchers focused specifically on ingrown toe nails which, though recognised for a long time, still lack a satisfactory treatment as the causes remain largely unknown. When devising their equations, the researchers accounted for the strong adhesion of nails to their bed through tiny, microscopic structures, which allow the nail to slide forwards and grow in a “ratchet-like” fashion by continuously binding and unbinding to the nail. By also taking into account the mechanical stresses and energies associated with the nail, the researchers came up with an overall nail shape equation. The equation showed that when the balance between the growth stress and adhesive stress is broken — if a nail grows too quickly or slowly, or the number of adhesive structures changes — a residual stress across the entire nail can occur, causing it to change shape over time. The results showed that residual stress can occur in any fingernail or toenail; however, the stress is greater for nails that are larger in size and have a flatter edge, which explains why ingrown toe nails predominantly occur in the big toe. 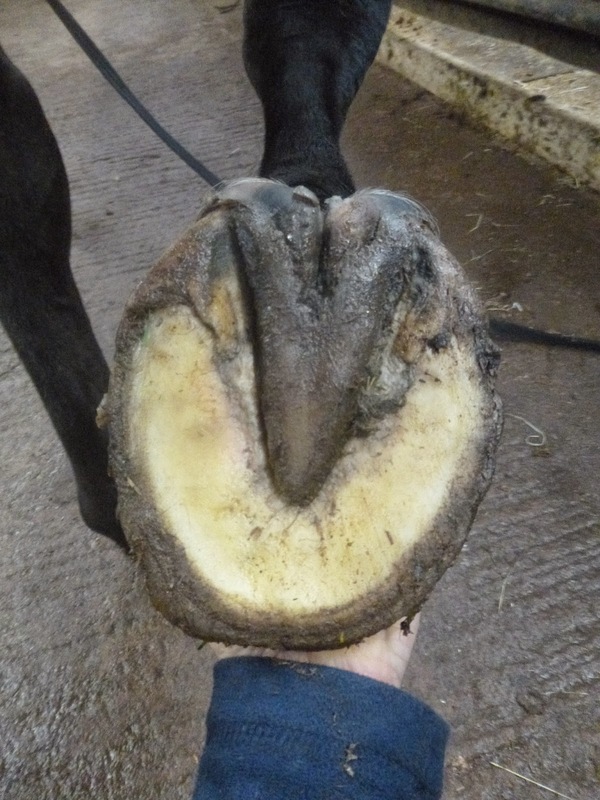 Research on toenails but serious food for thought - or it should be - for anyone who trims hooves. Many thanks to Freya Brookes for sending me this info! Yet another computer go-slow but I've beat it into submission and managed to get one of Bogie's comparison photos up now that he has been here 4 weeks. 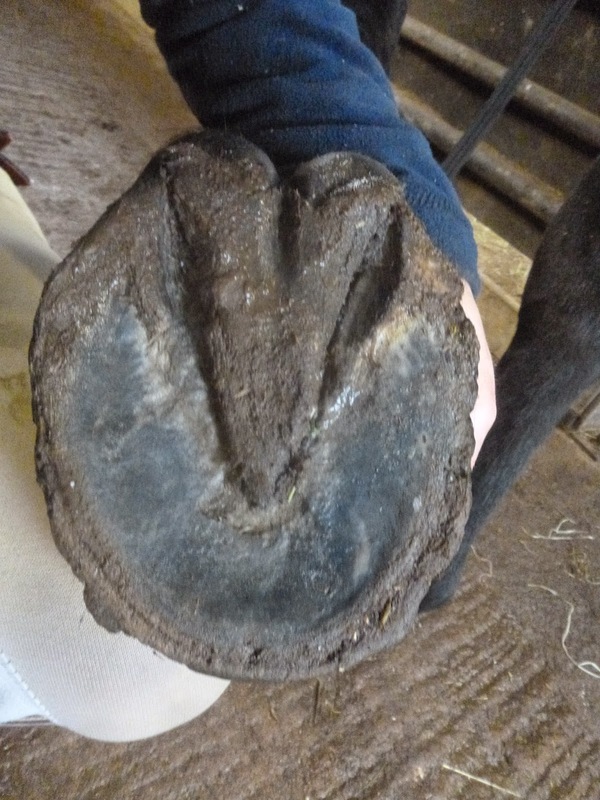 Bogie had been out of shoes for 6 months before he arrived but had a relatively weak palmar hoof, though still better than many which we see on horses arriving here. 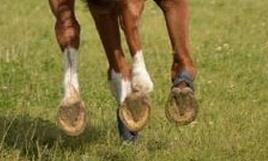 He also had fairly long hoof wall, particularly at the quarters and toe, which he is now shortening gradually. As regular blog readers know, I normally include caudal and lateral comparison shots, but having reached this point last night my computer had a meltdown and I strongly suspect that its not long for this world. Since its 7 years old I shouldn't be entirely surprised but it will have an effect on blog posts tip I get it sorted. Sorry, but more as soon as I can get it fixed! I meant to get these photos up this morning but the computer and the internet have been against me all day. Still, eventually here are Ernie's photos showing a comparison over the last 2 weeks. With Ernie, as with most horses, we are looking for better frog and palmar hoof development and a stronger, more functional hoof. We are only a fortnight in so its early days but his frog and sole are working harder and his bars are straighter and more even. As ever, the caudal shots are some of the most interesting. Apologies that the angles are not identical but the frog and digital cushion are tougher and developing better today so lets hope that continues over the next couple of weeks. 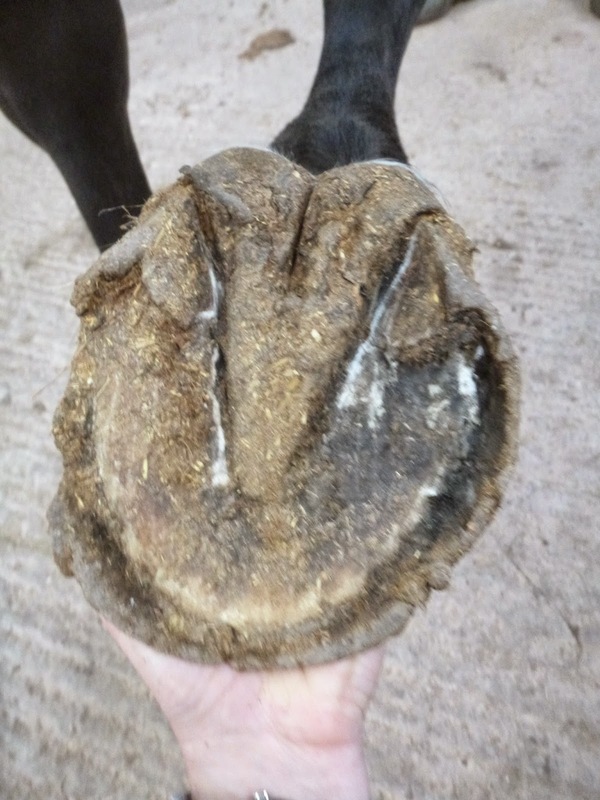 Not a huge change from this angle but a slightly less deviated hairline is a good sign and his hoof capsule is growing at a decent rate as you can tell from the disappearance of the nail holes. The central sulcus split is still evident on his RF but its improved slightly and hasn't stopped him from working the frog on this foot. Finally, here is Ernie's footage - again apologies that the new footage is so dark - the perils of October but I will get the halogen lights sorted out for shooting soon. Ernie-landing from Nic Barker on Vimeo. Haven't had one of these for a while but this was such a great shot that I had to post it! 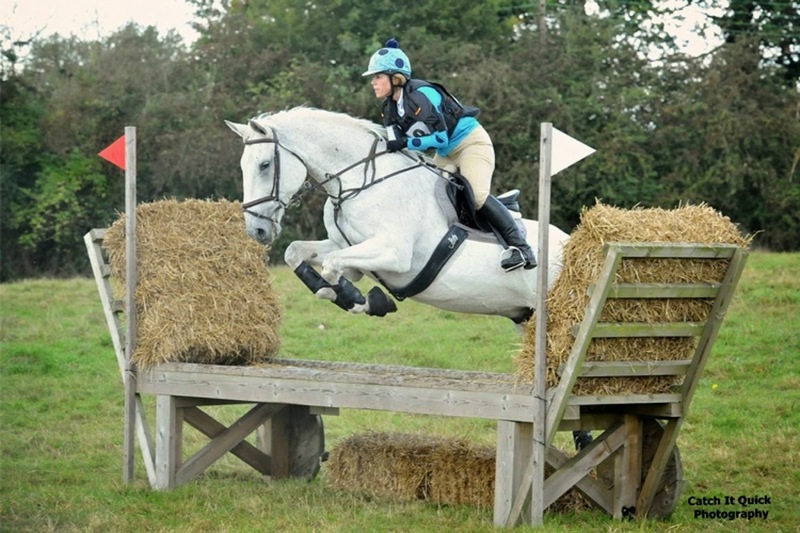 This is Indy, who was here last year, celebrating going XC for the first time in 3 years - doesn't he look fab? Big congratulations to Emily for all her hard work and the well-deserved reward! Apologies to Eager's owner, Nicola, who has had to wait til now for her photos even though she arrived at the weekend. Eager is only 5 and has, as far as we know, never been shod so she has pretty nice feet - a much better frog and digital cushion than I normally see in horses on arrival and fairly strong hooves. 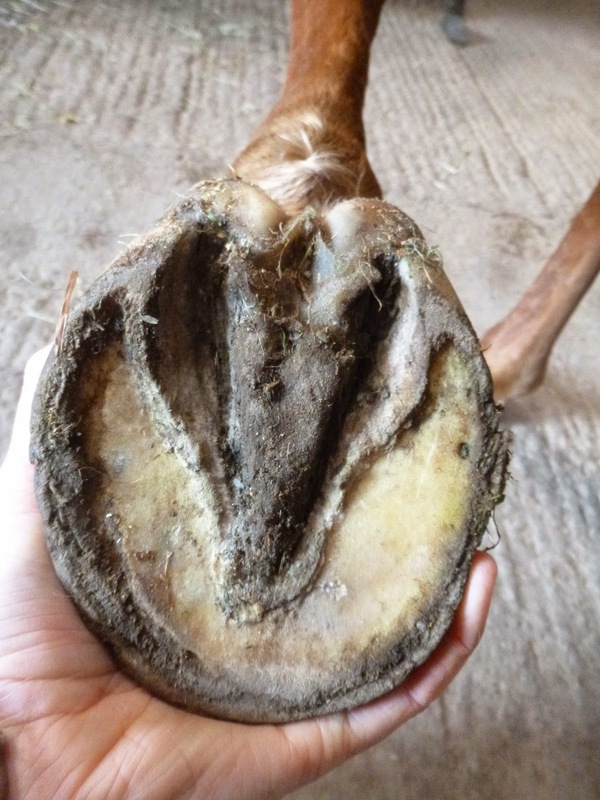 You could look at photos and conclude that she doesn't have a thing to worry about where her feet are concerned - and this is why you should never rely on photos or a static hoof as a way of assessing hoof health! 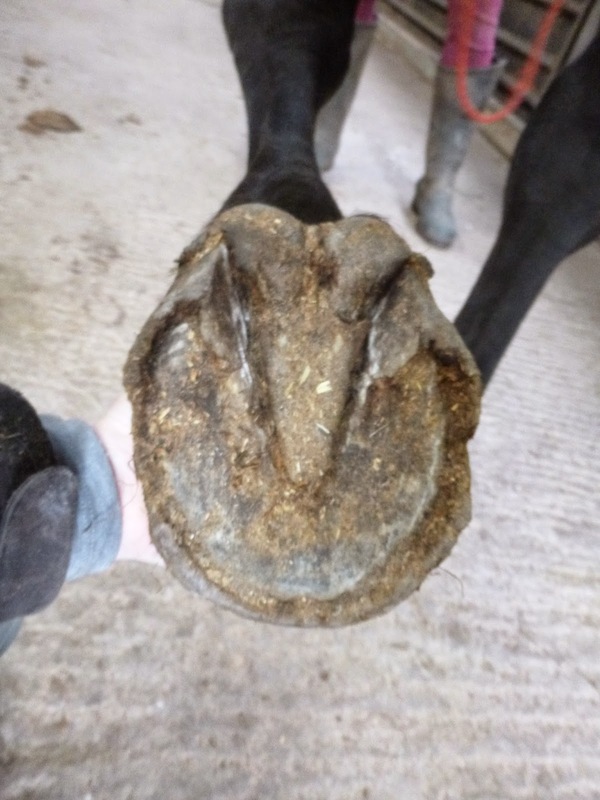 These ARE nice feet - but Eager has an imbalance which means she is landing only fractionally and intermittently heel first (when she should be definitively heel first with a good palmar hoof like this) and she is landing on the lateral heel which means she is unevenly stressing the hoof. A lameness work up before her MRI identified a bilateral lameness which was worse (3/10) on the LF and which also affected the RH. The MRI itself showed "mild loading changes" to the navicular and pedal bones and some soft tissue damage, though this wasn't severe. In a foot like this, which has a good baseline of strength, I would expect to see fast changes so expect more on Eager soon. I missed posting Alfie's update last week so he has now been here 10 weeks and its long overdue. 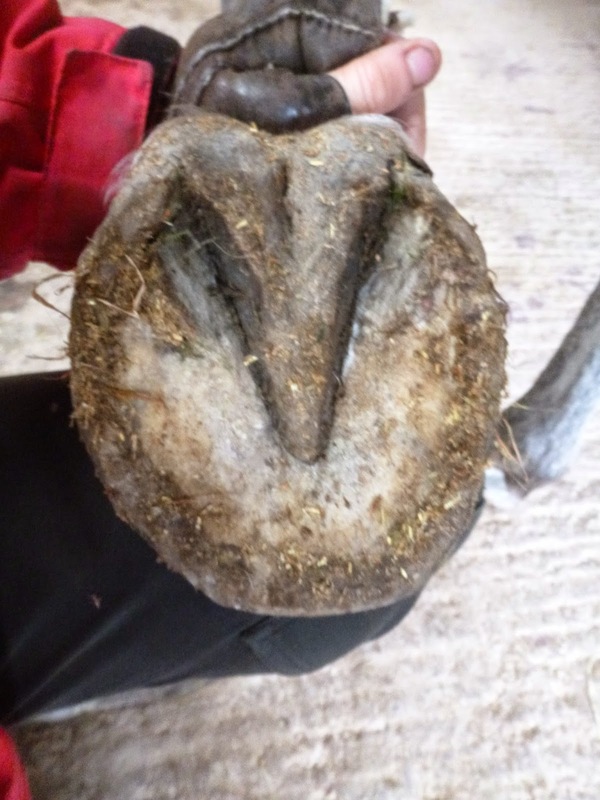 He had adequate hooves when he arrived but although he had been out of shoes for several months there was little development at the back of the foot as you can see in the top photo. However Alfie was keen to get going and was able to work on tougher surfaces relatively quickly which has helped to strengthen his feet considerably. His heels are now less under-run, his digital cushion is deeper and stronger, his toes have shortened and his whole hoof capsule looks more capable. This is now a more balanced foot but his heels need to come back to be more supportive of the limb. 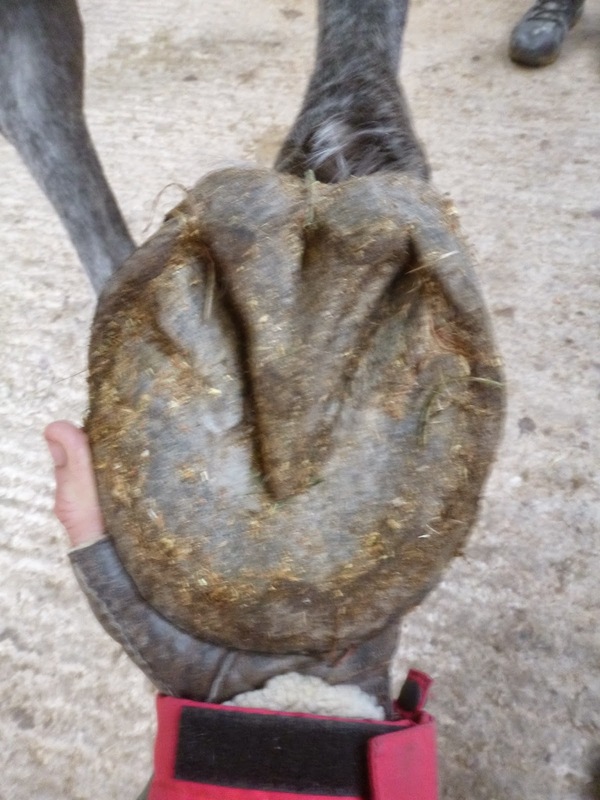 This should continue to happen as he grows in a healthier hoof capsule. Overall, his foot is more symmetrical when you view it from the sole - this is a key factor in checking whether his media-lateral balance has improved. 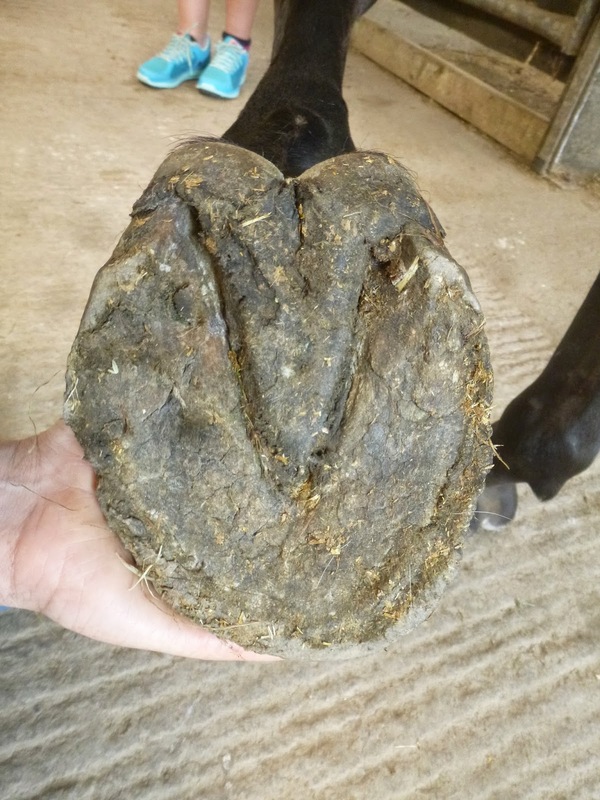 A much stronger palmar hoof - better frog and digital cushion development. A similar picture on his LF though its not quite as good yet as his RF. There shouldn't be any question which is the healthier, surely?! Finally, here is his footage showing his landing today. He is now clearly heel first and loading both medial and lateral sides of his front feet evenly as he lands, which is great news. Alfie from Nic Barker on Vimeo. Like Felix, Filly went home on Sunday so its time for her update. Apologies for the differing angle of these photos but when there are 3 horses coming/going with 3 sets of owners and 3 sets of photos to take its not always possible to perfectly replicate. 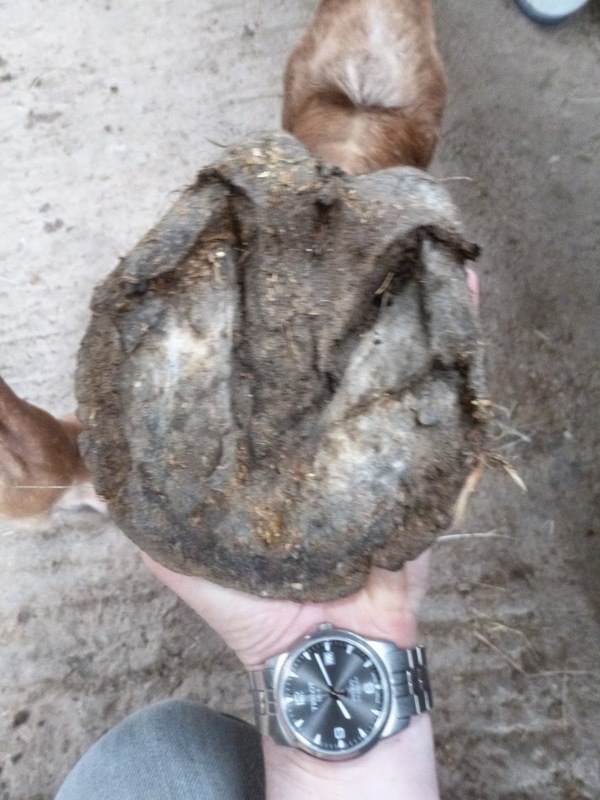 As you can see, she suffered a nasty abscess at the toe and although that has now resolved it has left a nice clear marker of how fast her hoof is growing. At the business end the comparison shots are clear. Like Felix yesterday, a hairline which is diving towards the ground is a sure sign of a contracting heel and in her original photos there is little or no depth to the digital cushion. The much greater depth is clearly visible today - all you need to do is compare the distance between hairline and hoof wall. 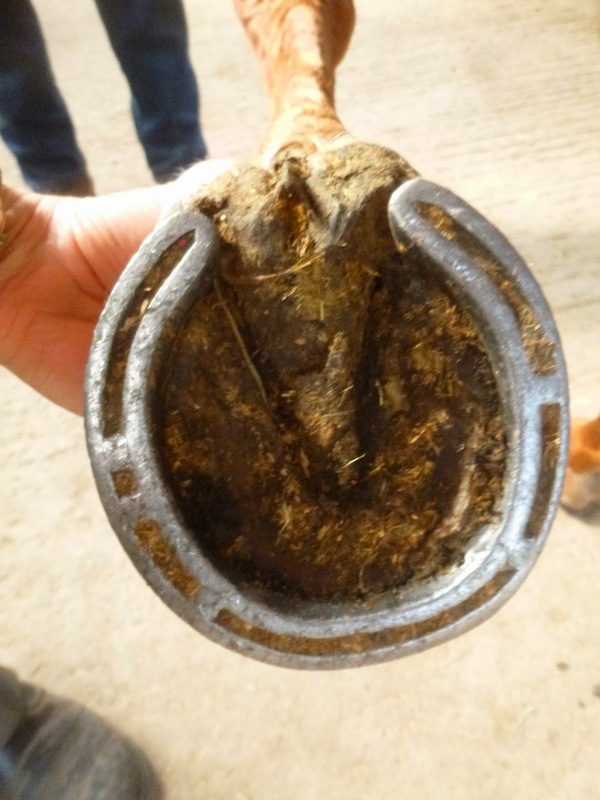 Shorter, straighter hoof walls are more supportive along with a healthier frog. These photos were taken on arrival and immediately after shoes came off. The lower photo is the same foot a few weeks in. Still relatively weak, with a ridge of sole extending from the bars which is typical of thin, flat feet. Today (below) the frog is broader and healthier and the ridge of sole has disappeared as she has built better concavity and sole depth. No trimming has been required to achieve these changes, only work on varied terrain, a good diet and patience. 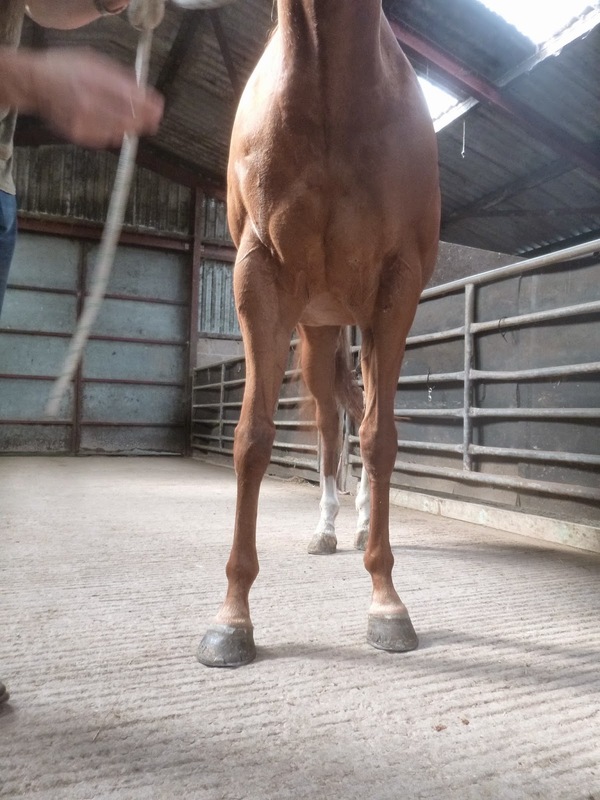 Her new point of break-over (where the new hoof growth will hit the ground) is clear to see and will result in a much shorter toe in a few weeks' time. Again, a different angle for which apologies. Nevertheless the better digital cushion depth is clear when you look at the hairline and the angle of the new growth is also clear. 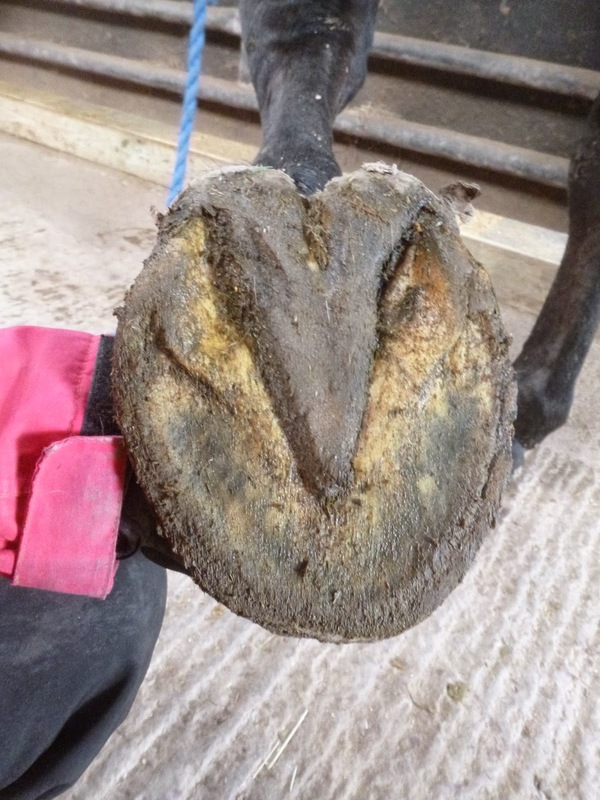 This will result in a shorter toe and more supportive palmar hoof over the next few weeks and months. 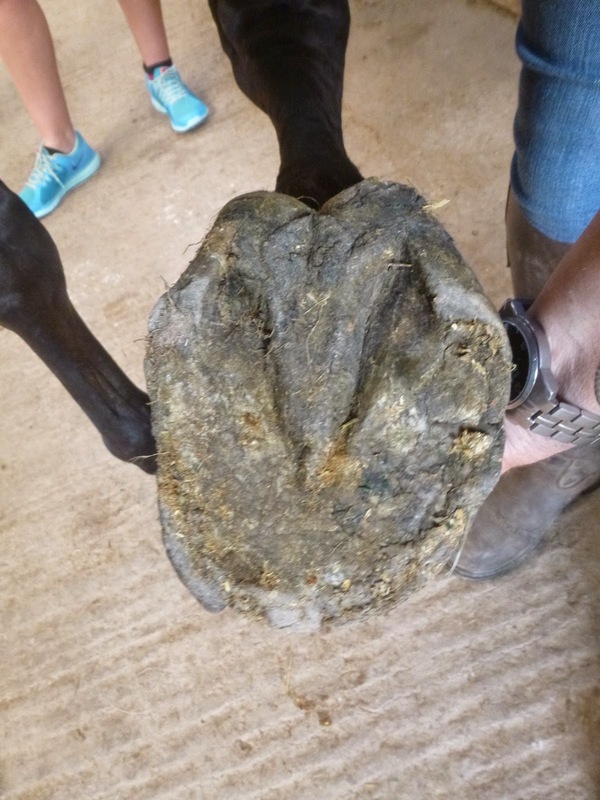 As with the LF, a stronger digital cushion, shorter hoof wall and healthier frog. 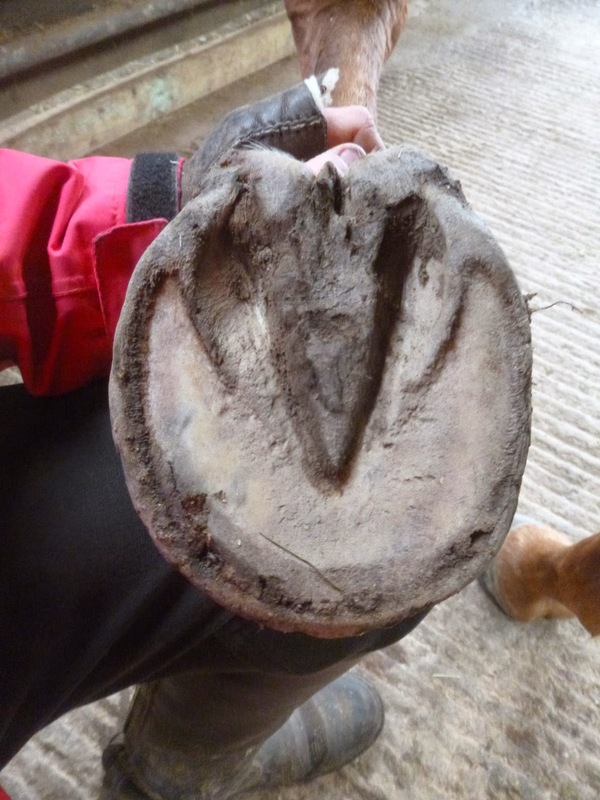 This is all critical not only for hoof balance but for the integrity of the palmar hoof. As you can see from these photos, the under-run heels on this foot were clear. Today (below) the heels are much improved and considerably less under-run. The sole is tougher and not so flat and the toe, as with the LF, will become shorter over the next few weeks; as with the LF, her break-over is already coming in at the point where her toe will be once the new growth is complete. As with Felix, her stance is to my mind much more balanced today and should improve further has she grows a fully balanced foot. Here is the comparative footage for those interested in how her landing and loading have improved. Filly from Nic Barker on Vimeo.